Camping La Hallerais är en camping i Taden, Côtes-d'Armor, belägen vid en flod/ en bäck. Denna terrasscamping har platser med stängsel, med skugga och platser med lite skugga. Det finns möjlighet att hyra husbilar och bungalows. På campingen finns en lekplats och ett sportområde. För den sportige semestervandraren har campingen olika cykelleder. Det finns ett ett fitnessrum. Campingen förfogar över en utomhusbassäng och ett knattebad. Denna inspektör gör varje år ett besök på Camping La Hallerais och inspekterar campingen för ca 200 faciliteter och för andra förekommande punkter. Inspektören är en medarbetare från ACSI och arbetar inte för campingen. Well located and good value for money. Staff were really helpful. Free WiFi and good facilities for a March stay. A perfectly placed site, above the River Rance and close to the delightful town of Dinan. Hard standings for shoulder months. Top facilities, heated when necessary. Close to Dinan, a lovely Medieval pretty town. We stayed here for the St Malo Ferry. (40 min drive). Lovely site with heated pool, crazy golf, tennis, gym and games room. There is a bar but we didn’t try it. They do sell bread and croissants in the morning. You can walk to town in 20 minutes but this is to the port at the bottom of the hill where there are some restaurants, bars and you can hire a motorised boat, it is then a steep climb up into the pretty medieval town where there are mainly Creperies. There is also a lovely cycle tow path for miles each way, we went to Léhon easily and then onto Evran after about an hour and a half from the camp site, it’s a pretty cycle past lots of locks and it’s flat all the way. However to get to the river path from the campsite is a very steep climb up/down from the site on steep muddy steps. It would not be easy for little ones on bikes. And the cycle up the hill instead is steep and long. We did it during the day with our 10 and 12 year olds who are fit and they made it but wouldn’t want to do it at night with bikes. Stayed 4 nights in the \'half term\' period so unfortunately no ACSI discount but still fair value. Handy for Dinan a 2km walk along the river. Site well maintained and facilities good. Free wifi near office but unfortunately not across whole site. Didn\'t use restaurant but looked good and fair value. Warm reception. Site getting busy and high season rates in place. Pitches separated by hedges, each with individual electric, water and waste. Sanitations are of a very high standard. All facilities are top notch, the grounds are well maintained. Only negative is the path to the adjacent canal: 200 metres of steep slope, largely stepped but in part washed away and hugely overgrown. This would be a massive selling point - if only a zigzag path were cut to allow access to the canal towpath for pushchairs, wheelchairs and bicycles. We left our tandem on site, risked the slope and walked into the beautiful town of Dinan. Absolutely stunning! I feel the 8.3 average is low . This is an excellent campsite . Beautiful site with flowers everywhere - very well maintained and friendly staff - hope to return on way home ! Very nice campsite. Staff very helpful. Toilets/showers very clean and plenty of them. Lovely surroundings and Dinan is just a few K's down the road which is a lovely town on the river. One small complaint, wifi only works right next to reception and nowhere else around site. When at reception, wifi is fast and reliable. They just need to install a few access points around the site and it would be perfect. Vill du boka Camping La Hallerais eller få mera information? Det går bra med nedanstående uppgifter. 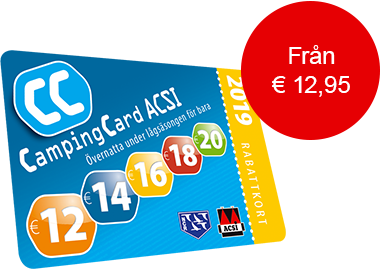 ACSI Eurocampings skickar din informationsförfrågan till "Camping La Hallerais".